In this chapter we shall provide practical advice on how to write scripts with SFS. Scripts allow you to combine the functionality of SFS tools, displays and file structure to create new applications. In particular they allow you to perform the same operation on many files without having to process each file individually in SFSwin. We'll look at three approaches to scripting: (i) using the CYGWIN shell language, (ii) using SML, and (iii) using MATLAB. The CYGWIN environment can be downloaded free of charge from www.cygwin.com. Download the setup.exe program and run it. This will allow you to connect to a mirror server near you, and to download the current list of available components. You only need the basic components for scripting with SFS, but you may care to browse the list to see if there are other packages that might interest you. For example there is a complete C/C++/Java/Fortran programming environment. Otherwise add the name of the Program subdirectory where you installed SFS. OK the changes and close the control panel. You can check that the path is correct by starting a Command Prompt window from the Start programs button, then typing "PATH". A complete list of directories is produced and the SFS Program directory should be included. Start the CYGWIN environment from the Start button. A BASH shell window will open where you can type shell commands. Type "echo $PATH" to check that the SFS Program directory is included in the executables search path. You will need to use a plain text editor to create shell scripts. Windows NOTEPAD is one possibility, but TEXTPAD is a highly recommended alternative with much greater functionality. One important use of scripts is to combine a number of elementary operations into one: this allows the user to call up a standard sequence of operations with just one menu operation. Note that this script only takes a single filename as an argument. It automatically processes the last SPEECH item in the file. We'll look at how to process multiple arguments in the next section. In this script, the first line strips off the ".wav" to leave a variable called "base" containing the base part of the filename. 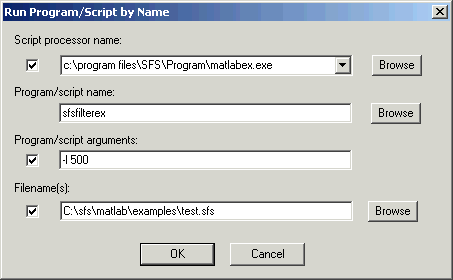 This variable is then used to create the name of the SFS file and the annotation file. Note the use of back-quote characters in the first line. 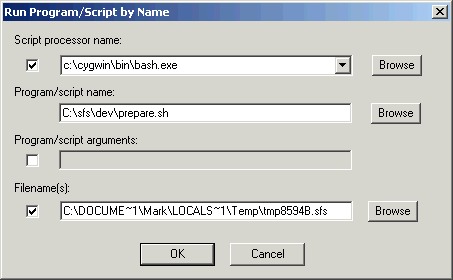 We can run this file using Tools|Run Program/Script and supply the name of the WAV file as the single argument. *)    echo "Unknown option: $option"
After the options have been processed they are removed from the argument list, leaving only the unprocessed arguments. Here is an example in which both item selection and another argument are processed. In this example, a speech signal and a phonetic transcription are supplied, and the result is a time-aligned annotation item. The process involves the generation of a formant synthesized speech signal and cross alignment with the original signal. Another important use for scripts is to automate the processing of multiple files. For example, it is often required to process a whole directory of files through the same SFS processing steps. In this example we change a number of audio files stored in WAV format so that they would be compatible with burning an Audio CD. Whatever the input sample rate is, the output should be stereo files sampled at 44,100 samples/sec. Our final script uses a conditional test on the existence of a file. The script displays all the SFS files in a directory, asking whether each is OK. If the file has been displayed, then a ".done" flag file is created. If the file is not OK, then a ".bad" flag file is created. This script can be stopped and restarted so that it skips over files that have already been processed. if test $x = "n"
SML is the built-in SFS scripting language for speech measurement. The language is fully described in section 1.5 of this manual. Here we look at some of its more advanced features which allow it to be used as a general purpose scripting language for SFS. The Speech Measurement Language interpreter sml.exe is part of the SFS installation, and does not need to be installed. In this section we will look at using the standard functionality of SML for measuring, calculating statistics, and plotting results. In this script we calculate some basic statistics about a fundamental frequency item in a single file. We calculate the mean and standard deviation, and the percentage of time spent voicing. To run this script on a single file, we select the FX item and file we want to process and choose the Tools|Run SML Script option in SFSwin. If the Output listing file option is left blank the output from the program is displayed on the screen. print "Processed : ",nfile:3," files\n"
print "Total time: ",nsamp/100:5:1," s\n"
print " +/- ",val.stddev:5:2," Hz\n"
print "Median Fx :",i:4," Hz\n"
SML is particularly convenient for analysing annotations. Its built-in functions for counting annotations and using them for locating events are easy to use. In this example we'll just report a count of all the different annotation types to be found in a set of files. This program simply lists the new annotations to the output. You could capture the output into a file and reload with the program anload(SFS1). However, in the next section we'll see how to load the new labels directly into the SFS file. Finally in this section, we'll show how SML can produce simple graphs. 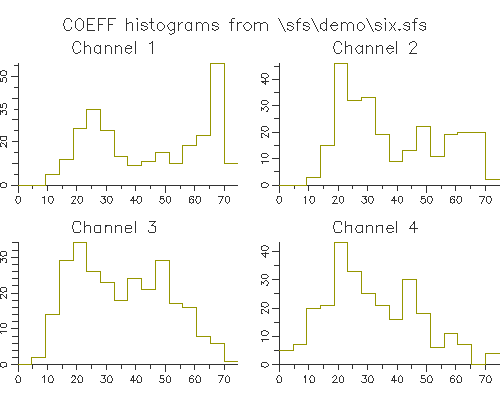 Here we'll plot a set of histograms of the values of the first 4 channels of some COEFF data set. These might, for example, be the first 4 filter channels of a voc19(SFS1) analysis. Because we don't know the range of values in advance, we make two passes over the data. Look at the manual page for dig(SFS1) for more information. Version 4 of SML introduced the new item variable type and a set of functions for reading SFS data sets into an item variable, for measuring and changing data sets, and for saving data sets back to SFS files. This function reads an item specified by 'itemstring' in file 'filename' into item variable 'item'. This function makes a copy of item stored in variable 'item2' into variable 'item1'. This function creates a new empty item in variable 'item' of type 'datatype' (SP, LX, TX, FX, etc), with the time interval associated with each frame set to 'frameduration' and the overall time offset of the item set to 'offset', where each frame is made up of 'framesize' basic elements, and room should be reserved for 'numframes' frames of data. Although 'numframes' cannot be dynamically expanded, it is not necessary for all of the frames allocated by sfsnewitem() to be written to a file with sfsputitem(). The function sets the history to a default value based on the name of the script and the type of the output item. Stores the first 'numframes' frames of data in the data set referred to by 'item' into the file 'filename'. Gets the value of a numerical parameter with name 'param' from the data set header referred to by 'item'. Available parameters are: "numframes", "frameduration", "offset", "framesize", and "itemno". Gets the value of a string parameter with name 'param' from the data set header referred to by 'item'. Available parameters are: "history", "params", "processdate", and "itemno". Returns string value of parameter or ERROR. Returns a value from the data set referred to by 'item'. The value is taken at offset 'index' in frame number 'frameno' . Returns a string value from frame 'frameno' of the data set referred to by 'item'. Returns a value from the frame header for structured data types. The frame is referred to by number 'frameno', and the field is referred to by number 'field'. Loads a section of any 1-dimensional item into an array. Data is copied from the waveform or track referred to by 'item' starting at offset 'start' for 'count' samples into array 'array'. Stores a particular numerical expression 'value' into a data set referred to by 'item' at frame number 'frameno' at frame offset 'index'. Stores a particular numerical expression 'value' into the frame header of a frame number 'frameno' of data set 'item' at field position 'field'. Stores a string expression into frame 'frameno' of the data set referred to by 'item'. Processes the data set referred to by 'item2' using the program and arguments in 'progname' and optionally loads a resultant data set of type 'rettype' into output item variable 'item1'. This function first saves item2 to a temporary file and runs the specified program on it. If 'rettype' is not an empty string then it is used to select the item to be loaded back in to item1. These functions are described in more detail in the SML manual page and in section 5.12.
print "  Files   : ",$filecount:1,"\n"
print "  Frames  : ",total:1,"\n"
print "            Test v-   Test v+\n"
print "  Ref v-  :",voice:8,"  ",voice:8,"\n"
print "  Ref v+  :",voice:8,"  ",voice:8,"\n"
In this section we'll look at some scripts which create data sets. Out first script creates a speech item that is a pulse train that falls in frequency from 150 to 100Hz over 2 seconds. In our next example, we convert a COEFF item into a DISPLAY item. This script recreates the operation of the dicode(SFS1) program. MATLAB is a commercial computer programming language and environment from Mathworks Inc. It is an easy to use language for signal processing, and is supplied with implementations of major signal processing functions. Unfortunately, MATLAB only has support for one audio file format, and only has relatively primitive support for building interactive applications. By combining the mathematical power of MATLAB with the interactivity of SFS, new applications of greater flexibility and utility can be constructed. We give some examples in this section. MATLAB should be installed from CD using its normal set up procedure. Normally this will mean installation to a folder on the C:\ drive of Windows. The MATLAB/SFS API can either be installed separately (from http://www.phon.ucl.ac.uk/resource/sfs/), or comes as part of the most recent SFS distributions. The MATLAB/SFS API is usually installed in the matlab subdirectory of the main SFS installation directory. To call the MATLAB/SFS API functions, it is necessary to put the API directory name on the MATLAB search path for functions. To do this, start MATLAB and choose the File/Set Path menu option. Click on Add Folder, and browse to the SFS MATLAB API directory. Click Save, and Close. When you are calling MATLAB functions in the examples below, it is also necessary that the directories containing the function definition files (.m files) are also included on the MATLAB search path. In this section we shall look at the API functions sfsfile and sfsgetitem. We'll demonstrate these operating within the MATLAB environment. % SFSFILE performs file level operations on an SFS file. %   an error is returned. %   all its current contents. The main file header is retained. % SFSGETITEM reads in a data set from an SFS file. %   about the meaning of the fields in the header structure. The following MATLAB function tests to see if a file exists and is an SFS file. If it is an SFS file then it lists the data sets in the file. The following MATLAB function tries to create an empty SFS file of a given name. If the file exists and is an SFS file, then it is just emptied. In this section we continue to look at functions that operate within the MATLAB environment, and which read from and measure data sets created by SFS. %   audio replay is complete before returning. %   REPLAY(fname) replays the last SPEECH item in the file. %   at time start and ending at time stop. %   at time start and ending at the end of the file. %   taken from the item anitem in the file. To create new data sets in SFS files requires the use of the SFS/MATLAB API functions sfsnewitem and sfsputitem. %   where progname is an assumed global variable. %   actually written is returned. In this example, we create apply a filter to a speech signal, and save the filtered signal as a new speech item in the SFS file. %   back into the SFS file. %   DISPLAY item in the file. %   seconds (0.003=wide band, 0.020=narrow-band). %   a COEFF item in the file. %   with the labels indicating the mean FX in each region. %   FX item in the file fname. The examples in the previous sections were functions which took the name of SFS files as arguments alongside item numbers and other operating parameters. However these functions can only be run from within MATLAB programming environment, which can be restrictive and inconvenient. In this section we shall see how these scripts can be adapted so that they may be called from the SFSWin program, using MATLAB as simply a script processing engine, just as we have used the BASH shell and SML as engines in sections 6.1 and 6.2. Note that command line parameters must be individually specified with a leading '-' and that values must be separated from the parameter names with a space. Let us now write a wrapper for the sfsfilter() function we met in the last section. The idea now is to take command line arguments specifying cut off frequencies and convert these into suitable arguments for sfsfilter(). We shall use parameters "-l lowfreq" to specify a low-frequency edge, and "-h highfreq" to specify a high frequency edge. Finally, we build a complete MATLABEX script for the modulation and demodulation of signals using the modulate() and demod() functions from the MATLAB signal-processing toolbox. This shows some tips and tricks for dealing with signals.